When change is the only constant in business, planning becomes a modern marketer’s biggest challenge. You can’t ignore it altogether in favor of constant flexibility, but you must come to terms with the reality that long-term planning is out of the question because the stakes might be different next month. We feel your pain and have helped clients solve it through our Agile Marketing Planning Workshop. Agile marketing planning balances your objectives for the next 12-18 months with a flexible approach for execution. During the workshop, we’ll teach your team how to take a forward-thinking approach and have the ability to stretch. This allows you to fail fast to grow even faster. Is your marketing roadmap constantly stymied by changes in your industry or market? Does your team feel stuck when it comes to pivots in messaging or execution? Are you unsure if your marketing plan will work now and in the future? Are you so busy executing, you don’t take time to plan? If you answered yes to any of these questions, the Agile Marketing Planning Workshop will solve all of these problems. WHAT is agile marketing planning? Agile marketing planning is an unconventional approach to developing your marketing roadmap focusing on a mixture of long and short-term initiatives. Using this technique, you set 12-18 month goals and adapt them over time based on changing priorities and business needs. Agile marketing planning is collaborative, unbiased and holistic. Key stakeholders from across the organization are included, and every voice is weighted equally. Planning covers it all: process improvements, systems and technology, marketing tactics, and team roles and responsibilities. No topic is left out, so you walk away with a complete plan you can feel confident about. Agile marketing roadmapping is important to any marketing organization that wants to be successful. That’s because revenue generation and annual growth are falling on marketing’s shoulders. In answer to this increasing demand, modern marketers must be forward-looking, take calculated risks, act swiftly in reaction to change, and create a culture of innovation. This is exactly what an agile mindset allows you to do. WHO needs an agile marketing roadmap? Modern marketers who want to drive positive outcomes for their teams and businesses can use agile marketing roadmapping in many ways. If you have aggressive goals or conversely, have a lack of marketing goals, agile marketing roadmapping aligns your team so you can execute consistently and quickly. It helps new leadership understand what works and what doesn’t when it comes to current processes. It paves the way for a plan to move the company forward, prioritizing team input. Other reasons to prioritize agile marketing planning is if you’ve recently implemented a marketing automation platform, if you have competing priorities among team members, or if you’re putting in lots of effort with little results. 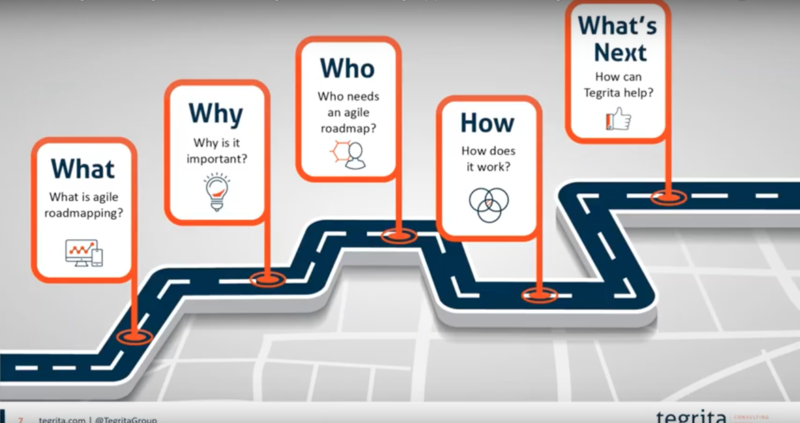 HOW does agile roadmapping work? We get all the right people on your team on the same page. Timelines, background prep, and initial brainstorming are all a part of this first step. We can’t prescribe the right marketing medicine unless we understand what the issues are with your current marketing performance, technology ecosystem and processes. It’s a date! We’ll get together somewhere fun to nail down what’s not working for you and what you need to do instead. It’s a judgement-free zone where every idea - no matter how seemingly crazy - is welcome. Creativity flows, and brilliant plans are hatched. You walk away with an agile marketing roadmap in hand. But we’re also going to give your team access to a digital version in our interactive agile planning tool. Once tinkering is done, we’ll release the final product. It’s time to grind. Whether you tackle the execution on your own or take advantage of our expert help, quarterly check-ins for the first 12 months come standard. We’ll refine and adjust so you get the most bang for your buck. Successful organizations are forward looking, take calculated risks, and act swiftly. Failing forward requires strategic thinking and planning. Your marketing roadmap should be progressive, include projects that drive growth, and improve efficiency over the next 12-18 months. Much like following a GPS to reach your destination, the route you take needs to be re-evaluated consistently to ensure you are on the optimal path towards your destination. During this session, you will be taught the "learning-unlearning-trashing-reinventing" approach to planning & roadmapping. What's Next: Get on board with agile marketing planning by scheduling a workshop with Tegrita today! What are your growth goals over the next 12-18 months?